An immigrant cap maker and his son founded Alleson Athletic in 1933 in Rochester, New York. Working in the basement of a downtown warehouse, the two entrepreneurs sewed men’s caps and apparel in an attempt to earn enough money to survive during the Great Depression. They succeeded beyond their wildest dreams — today, the company is the largest manufacturer of in-stock sports uniforms and a renowned manufacturer of sublimated garments. Still family owned and managed, Alleson Athletic is dedicated to providing high-quality game uniforms and practice wear. 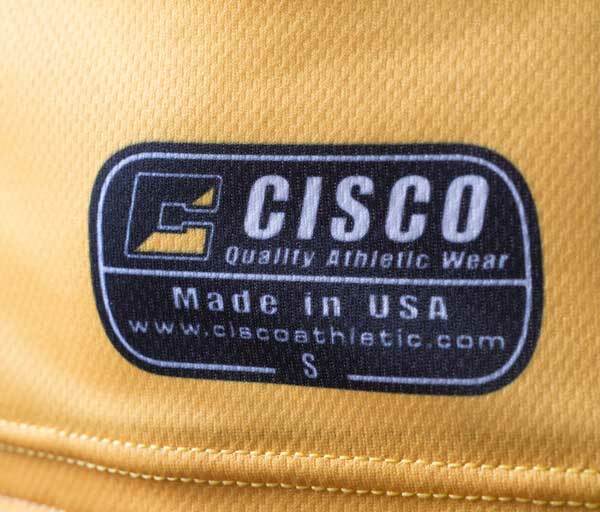 Adult and youth uniforms are sold through qualified dealers like Cisco. Alleson Athletic is the Cisco of stock uniforms. Like us, Alleson uses only top-quality materials and has decades of experience in uniform building. It maintains full stock, ensuring that the garments you want are available when you need them. If you wish to use a stock product and you are not wedded to the idea of name brands, our testing and experience indicate that Alleson is your best option for game uniforms. Its garments are durable and, thanks to the company’s extensive research, all new additions are on the cutting edge. Cisco customizes Alleson uniforms using our expert, state-of-the-art production methods. Alleson is trustworthy and reliable when it comes to timely product delivery. When customers take advantage of our partnership, they get a pro-level uniform with a custom look — and they get it on time and on budget.